The Heartland Pathway is a 4.5 mile walking trail between Monticello and Cisco Illinois. The trail was once an active rail line and was purchased in 1989, along with nearly 30 other miles, by Heartland Pathways. The trail is a thin strip of land set within a landscape dominated by agriculture. Yet, the trail harbors remnant prairie communities, and soils making it a vital part of the last square mile of remnant prairie in Illinois. 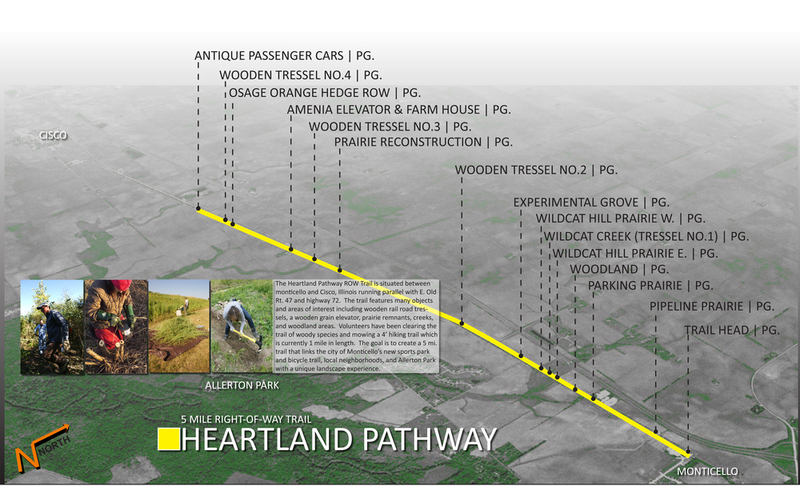 Urbana Land Arts and Heartland Pathways are working to Build the Heartland Pathway. Together we are developing a management plan for conserving and expanding prairie communities and encouraging people to experience the trail's unique landscape. In the fall of 2013, ULA held a week long exhibition focused on The Heartland Pathway.